Late Spring, early summer or early fall are some of the best times to visit Alaska. 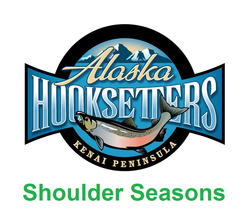 Each of theses “shoulder seasons” offers a unique aspect of the Kenai Peninsula, from budding trees and flowers, to the midnight sun, to the changing of the leaves. 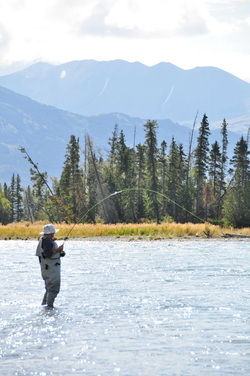 Salmon, Trout, Steelhead and Halibut are abundant in several rivers and in the salt as well. The July crowds aren’t choking the Kenai Peninsula and the fishing can be outstanding! Enjoy 7 days and 6 nights of great early or late season fishing and value with this special package. and you don't want to miss the opportunity. 2. You don’t want to share the rivers with the crowds of July and August. 3. You want to add adventures to your package with flexibility. All charters are considered full day and are a minimum of 8 hours, unless limits are reached and/or other arrangements made. We are fully insured and all guides are fully licensed and permitted by all agencies and associations including the Coast Guard. Our boats are customized Willie power and drift boats. Call for discounts for groups in increments of 4 people, 8 people, 12 people or more. Family and military discounts are also available.